(^_^)/ Moshi-moshi, let me introduce myself. 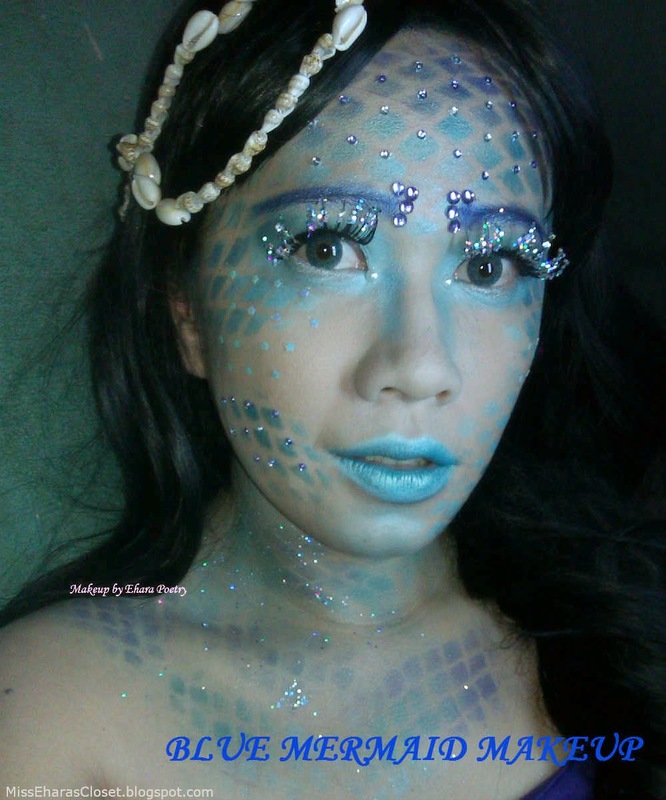 You will be surprised with what I use to make this blue mermaid makeup & how easy is this. 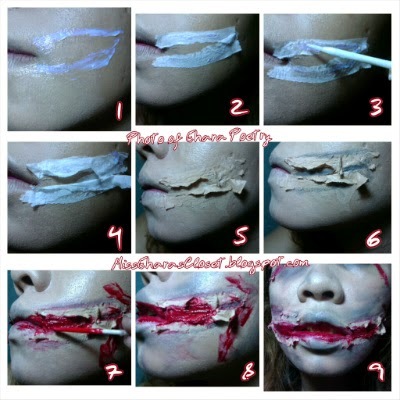 I will not talk much, halloween is coming very-very soon, you can do this makeup in just 1 hour! 2. 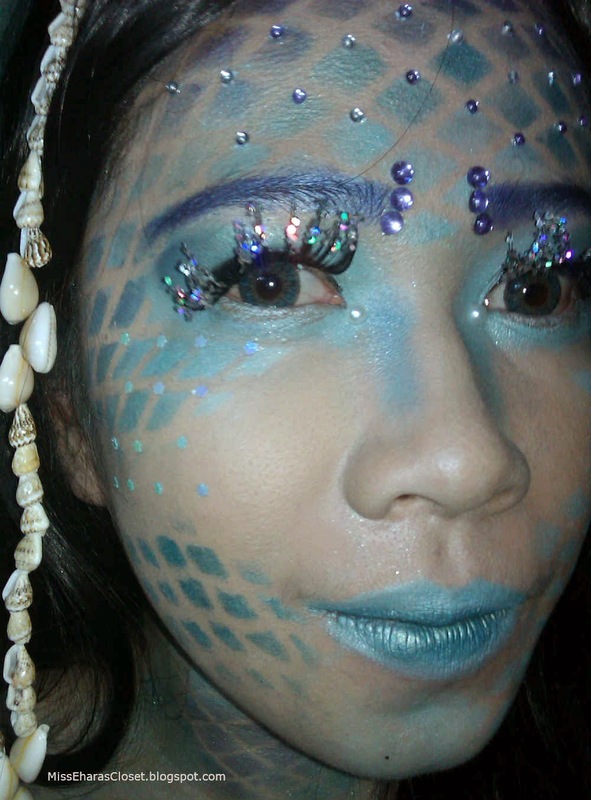 Apply blue eyeshadow with finger or sponge over your face. 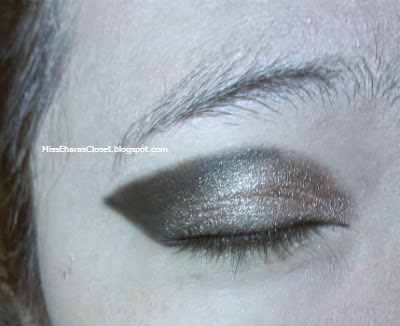 Add lighter shades or white eyeshadow to create ombre color. 3. Gently pull off the fishnet stocking / wig caps from your head. 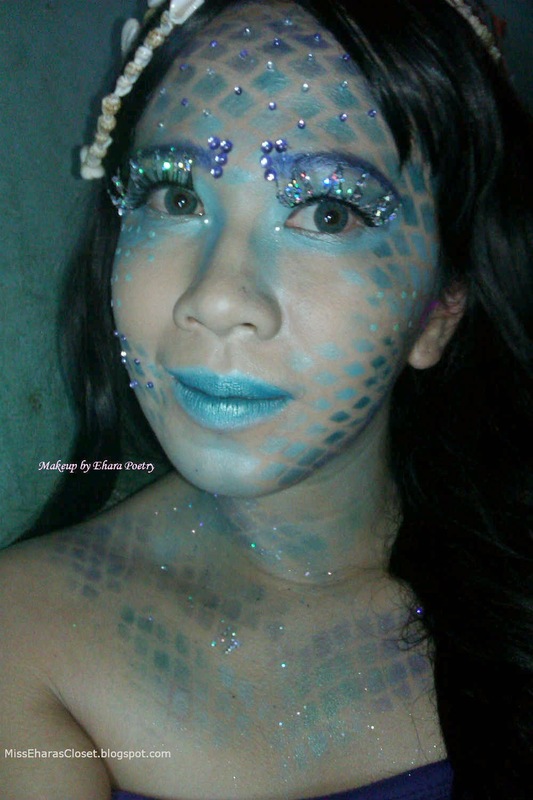 Tadaaaa....you have a mermaid skin now! 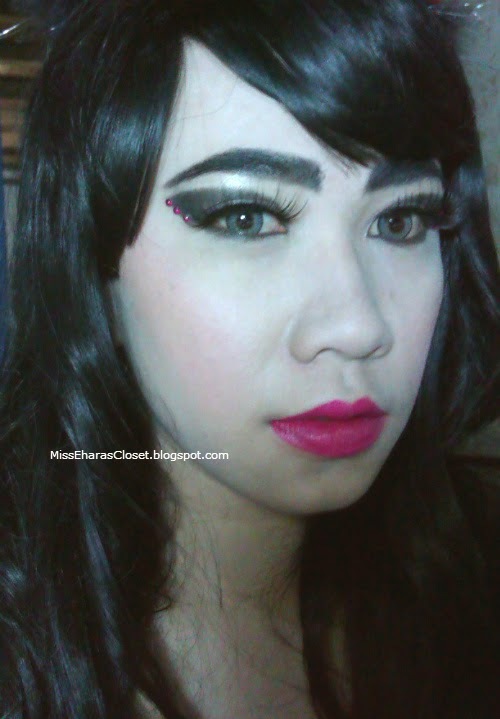 After that you can do other makeup, use blue eyebrow pencil/eyeshadow for the eyebrow, add blue eyeshadow to the bottom of the eyes and for nose shading, wear false eyelashes. I didnt wear loose powder but I sweep a powder brush to all over my face so my skin looks more blueish. 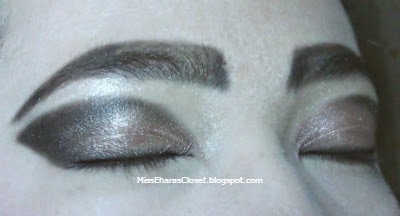 I use eyelash glue to stick the rhinestones, I also add glitter to my false eyelashes so they looks more pretty. 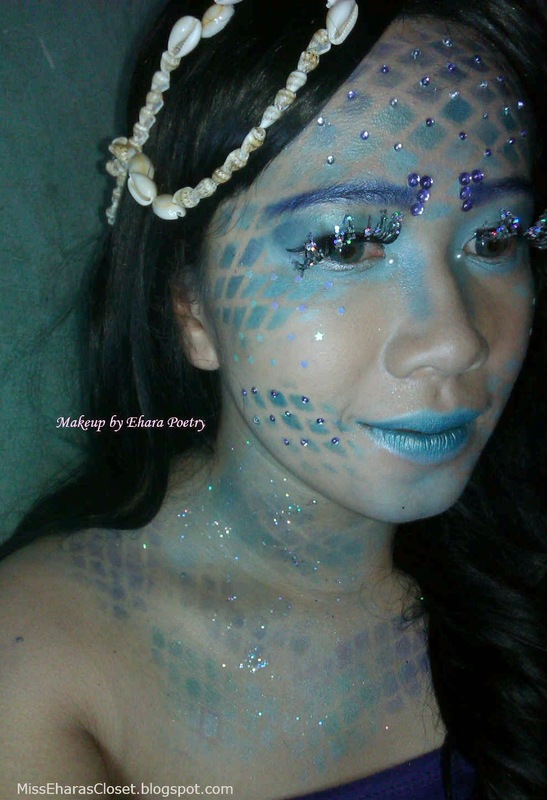 Requires a little patience to stick rhinestones one by one but believe me you will love the result! 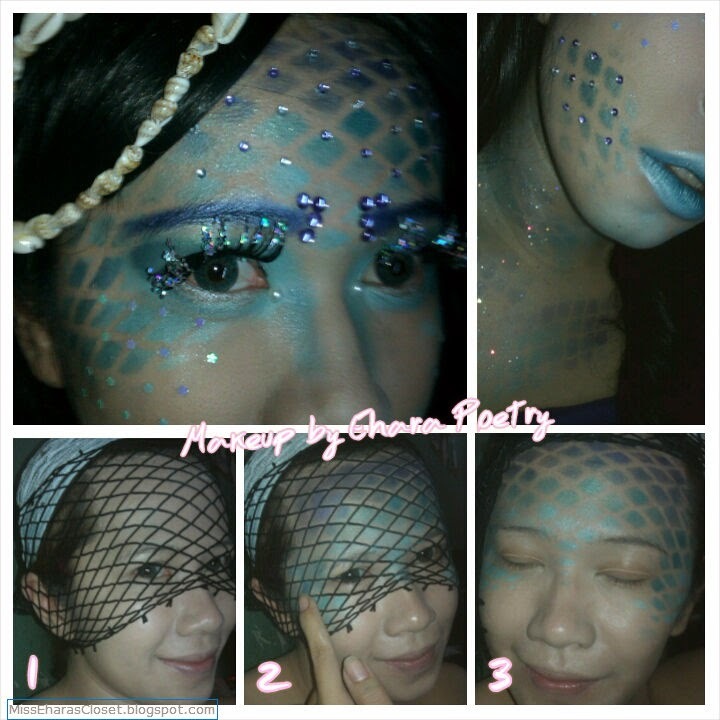 You can also do the mermaid skin trick for neck and all over your body if you want it. Just remember to hold your fishnet stocking / wig caps when you apply the eyeshadow. 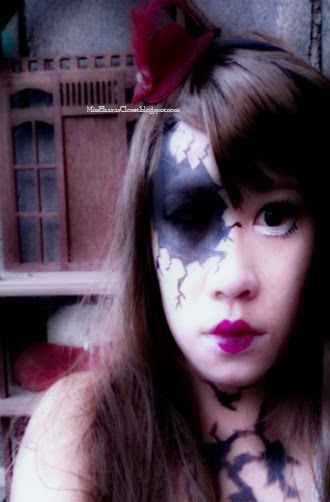 oooohhhh..what happen to my face??? 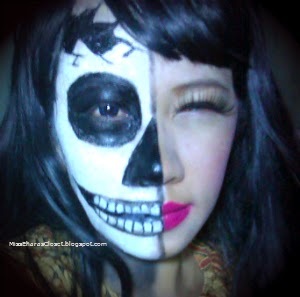 I can't get out with this half pretty & half skull face...can I? 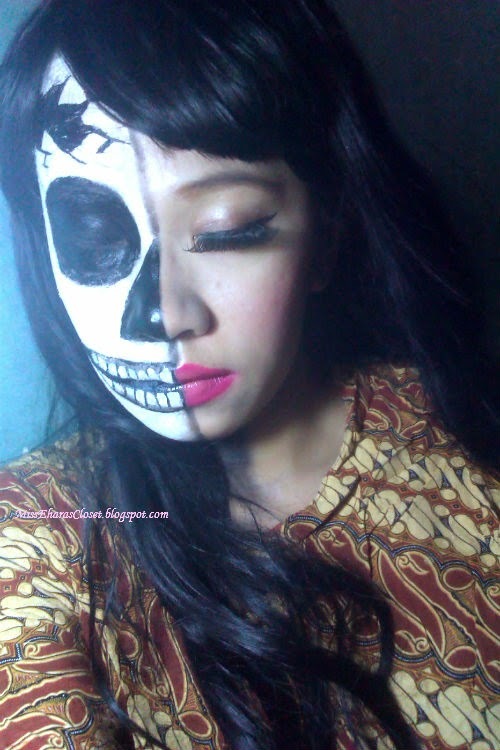 Is another Halloween makeup inspiration from me, Half Skull Face! 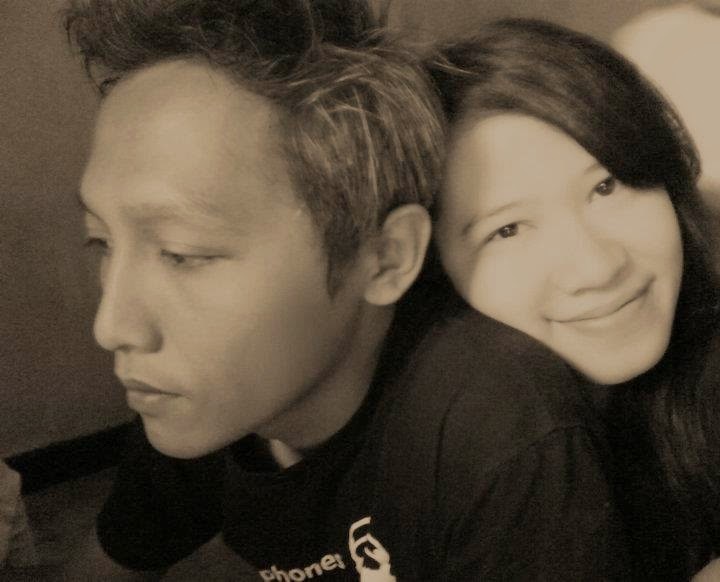 I give the looks of innocent when my hubby coming home, he really suprised.....and hate it. 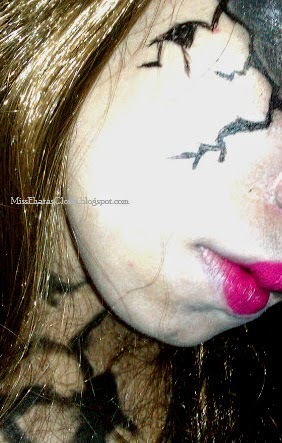 He said "Oh nooo, not again, another creepy personality of you"
First I use foundation, and by using an eyebrow pencil I made ​​a straight line in the middle of the face. 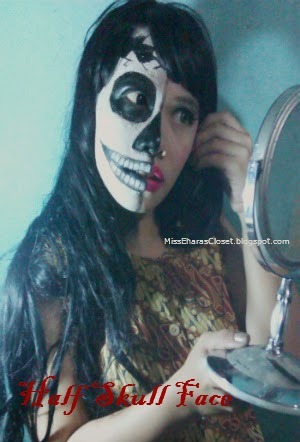 I do normal makeup on the left side, compact powder, eyeshadow, eyeliner, false eyelashes, eyebrow mascara, lipstick & blush on. On the right side or the skull side, for the white base I use baby powder mixed with a little water until the texture becomes like creams. 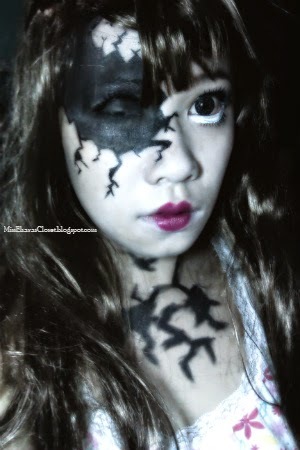 Then I draw the cracks part, eyes & nose area with stylo eyeliner pen and fill in the black with eyeliner gel. I'm not good at drawing, that drawings tooth skull was not a creepy skull not but a silly one, ahahaha. To make it look more dramatic I use two different colors of contact lenses. 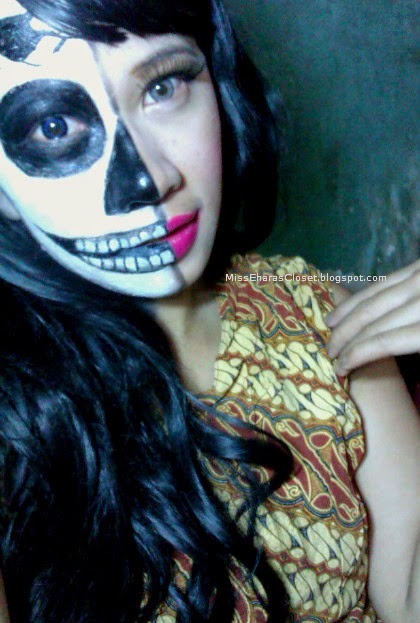 Halloween is coming very soon, I still have a lot of other makeup ideas, so little time! Waktunya masak cemilan yang cocok banget buat ngemil sekeluarga, cemilan nonton film, bekal piknik atau cemilan hang out bersama teman. 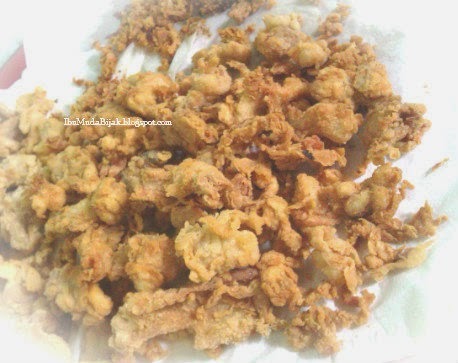 Namanya Crunchy Mini Chicken Popcorn. Yup, cemilan yang super renyah banget ini bentuknya mungil seperti popcorn, tapi bukan terbuat dari jagung looh! Dibalik tepungnya yang renyah ada potongan ayam yang yummy banget! Berbeda dari Chicken Popcorn lainnya yang potongannya agak besar & seperti chicken nugget. Crunchy Mini Chicken Popcorn ini lebih kecil-kecil potongannya, sekali hap! Udah gitu lebih banyak bumbu tepung keritingnya yang rasanya sooo crunchy, kriuk-kriuk-kriuk! 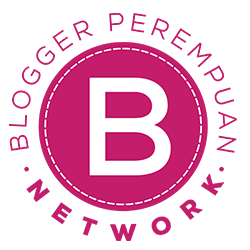 Yuk, intip resep & cara membuatnya disini..
Suka posting foto ke instagram? 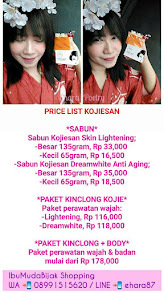 Pengen pamerin foto-foto Instagram ke blog tapi gak tau caranya gimana? 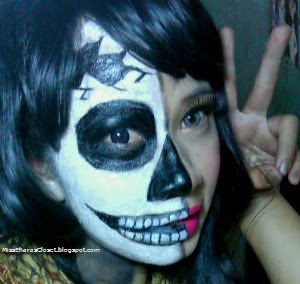 Halloween sebentar lagi, tau doong kalo halloween itu identik dengan yang serem-serem? 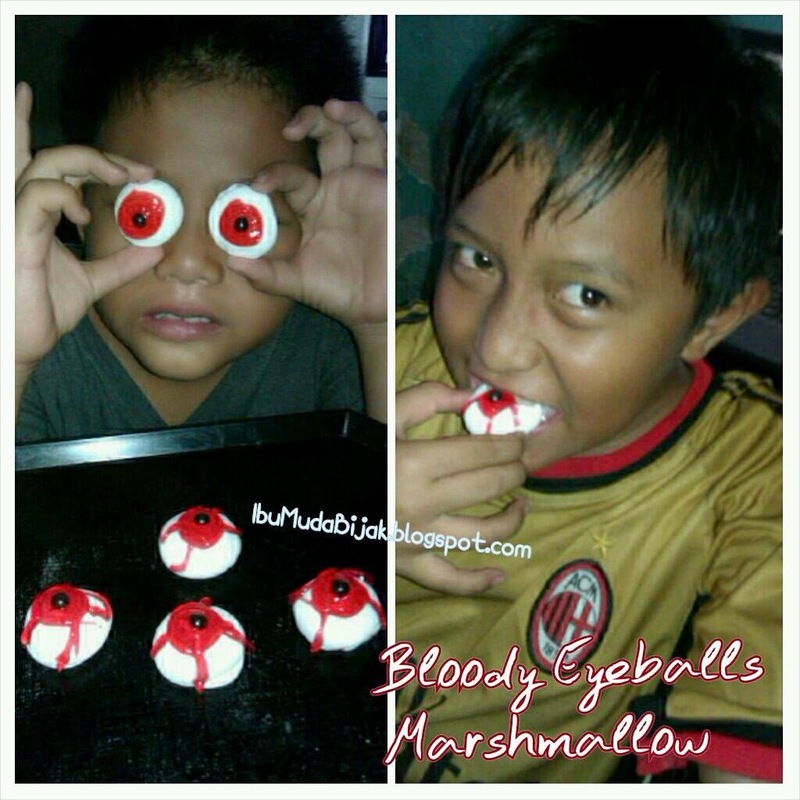 Naah, kali ini saya mau berbagi resep super simple untuk hidangan halloween, namanya 'Bloody Eyeballs Marshmallow' atau marshmallow dengan bentuk mata yang 'berdarah-darah'! 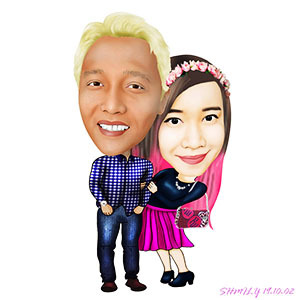 Uuuuu syerem banget kan namanyaaa...eh tapi rasanya manis looh! Kaka Viqie & Ade Virgie sukaaa banget ngemil ini, mereka berasa jadi 'monster' hehehe..
Mau tau cara bikinnya gimana?? 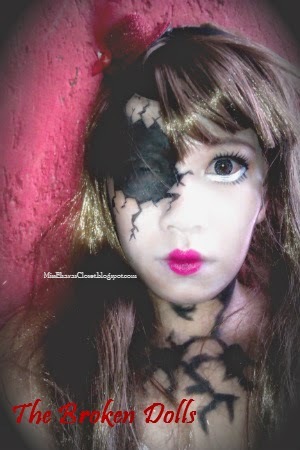 Tonight I want to give another makeup inspiration for your halloween, The Broken Dolls! First, I using Etude House CC cream Silky to all my face including lips (I like this CC cream because it can makes my skin looks more white & pale) and then I put on Cussons baby powder. After that I Create a small doll lips using IASO Lip Crayon Vivid Tint Flame Rose #V01 (It's my new favorite lipstick, haha). Then I shape the broken area on my right eye area using Kiss Me heroine make smooth liquid eyeliner #BK01 (I realize this is a waste, lol, next time I will using cheap eyeliner!) 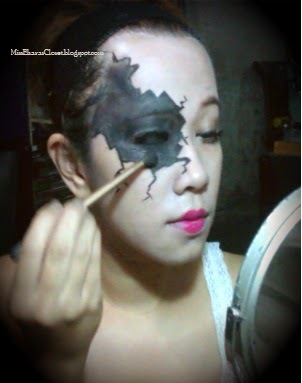 And then I fill the broken area with black eyeshadow, but to make eyeshadow stay all day & the color more vibrant I applying Etude House Waterproof 10 eyeshadow primer inside the cracking line area before I put on my black eyeshadow which is 'blackout' from Naked2 palette. 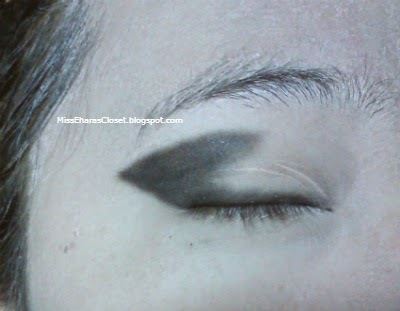 I apply it using shadow brush and sponge-tipped applicator to making sure it's evenly applied. 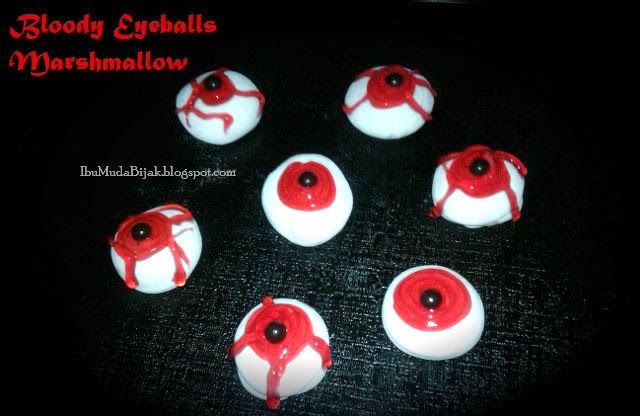 I create a 'doll eyes' on left eyes. 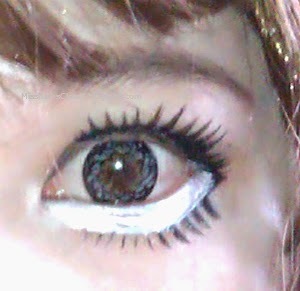 I wear big diameter Softlens, put on false eyelashes from Daiso brand (I love this lashes, very comfy to wear and cheap!) My eyebrow pencil is from daiso too. 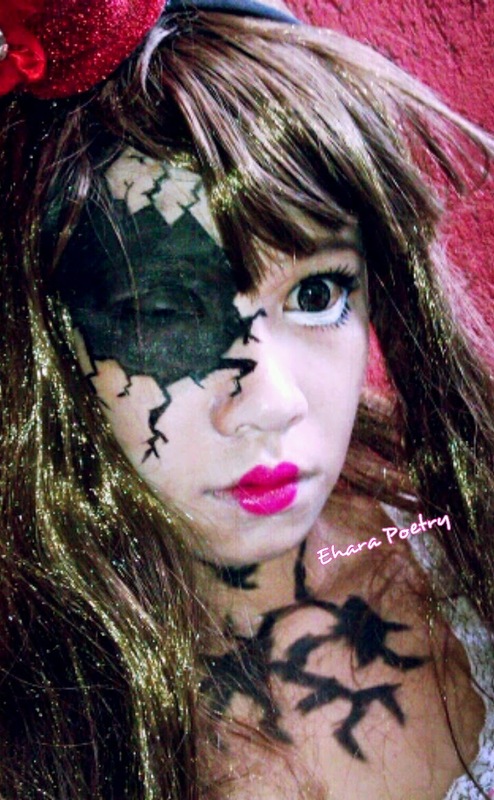 I apply Etude House Styling Eyeliner #2 White on the waterline and added more white lines under my eyes and then I put on under lash to create bigger eyes, look more awake and a little bit doll like. 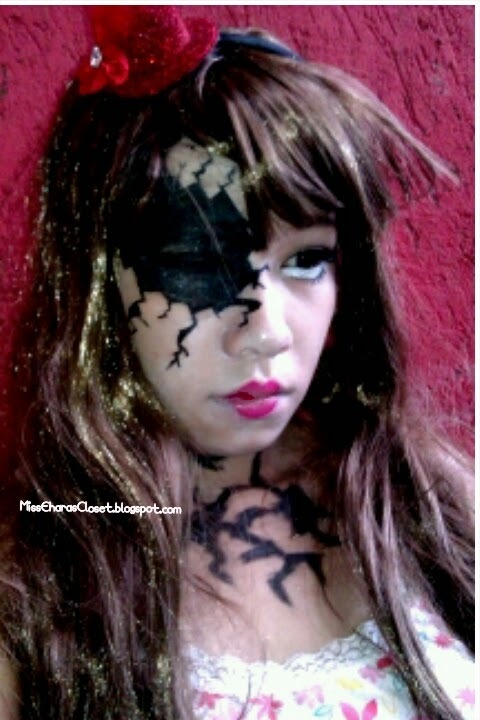 Last...I put on my wig & some accessories, I deliberately did not comb this wig so the hair looks ragged. 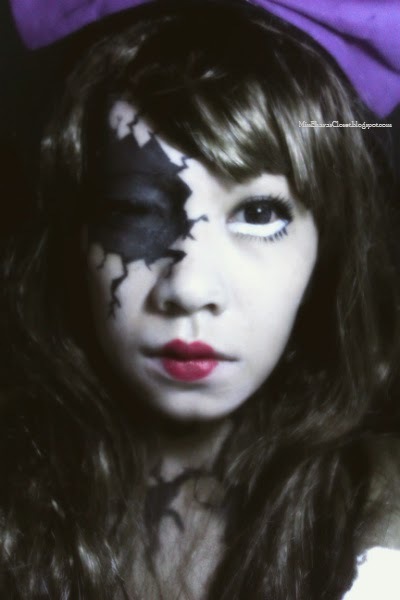 When I post this picture on Facebook & Instagram, many people ask me, how can your right eye can be all black? 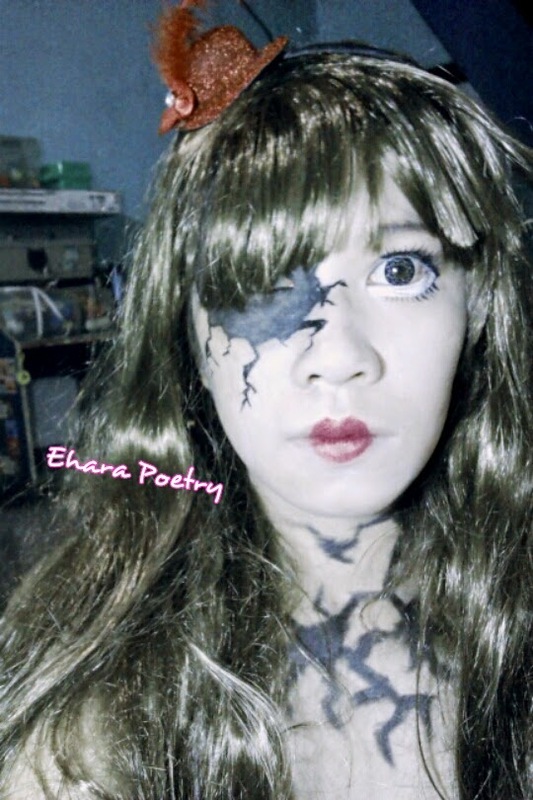 Did you wear special contact lens? With flash my wig look really shiny but the broken parts look more dark & dramatic! 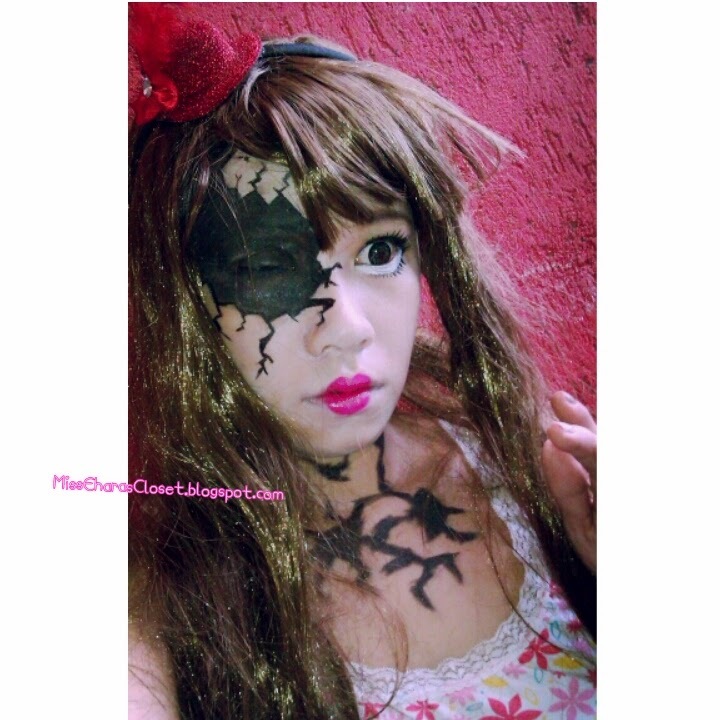 "I feel lonely because nobody want to play with me again.."
What do you think about this Broken Dolls makeup? 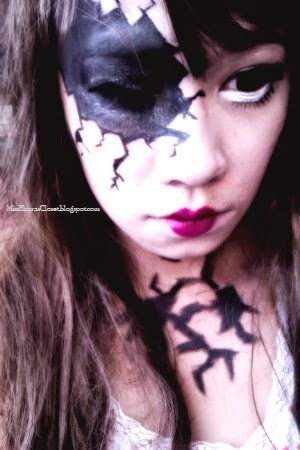 My first Halloween makeup is The Devil Queen makeup. 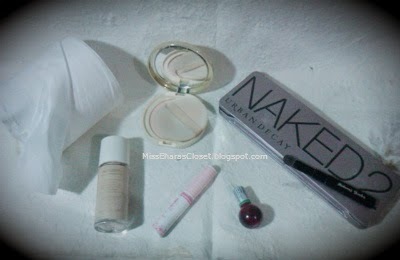 First: On clean face, I put Etude House CC Cream Silky, Canmake Loose Powder & Shara Share Color Drop Dot Powder. 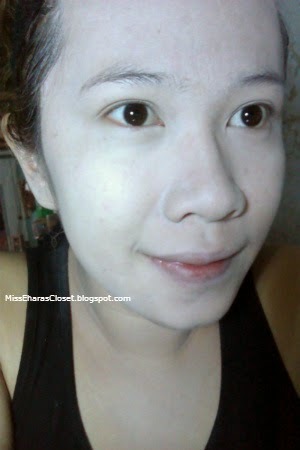 I prefer light makeup so I never wear any concealer, but I do put extra cc cream to create 'very white & pale' skin. Then I adding pink beads which is actually my nail art jewelry, I glue it with Stella eyelashes glue. I also add upper & under eye line using Dollywink Pencil Eyeliner. This super big lashes is very light, super comfort & it's also natural! 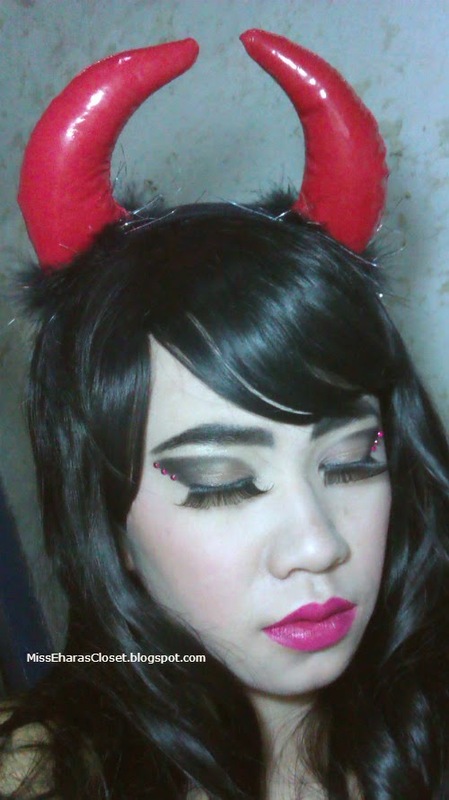 I got this lashes from Uniqso, I forget the number code but this Stella Natural Eyelashes collection. 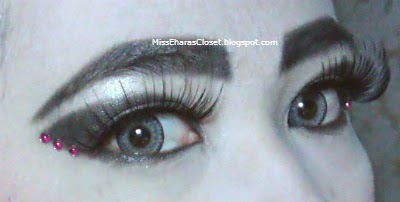 Actually I will not dare to wear this lashes for real activity outside my house because it's way tooooo long! But it's looks really great on photoshoot, I love it so much! 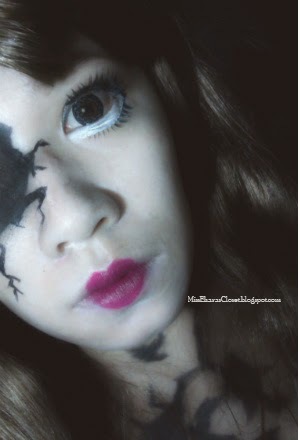 What do you think about this lashes? Too much or just perfect? This is my another new wig I bought from Japan, it's a long, black & curly wave hair type. It's my second wig, more comfortable & more real than my first wig (the blonde & the very cheap wig one, hahaha). 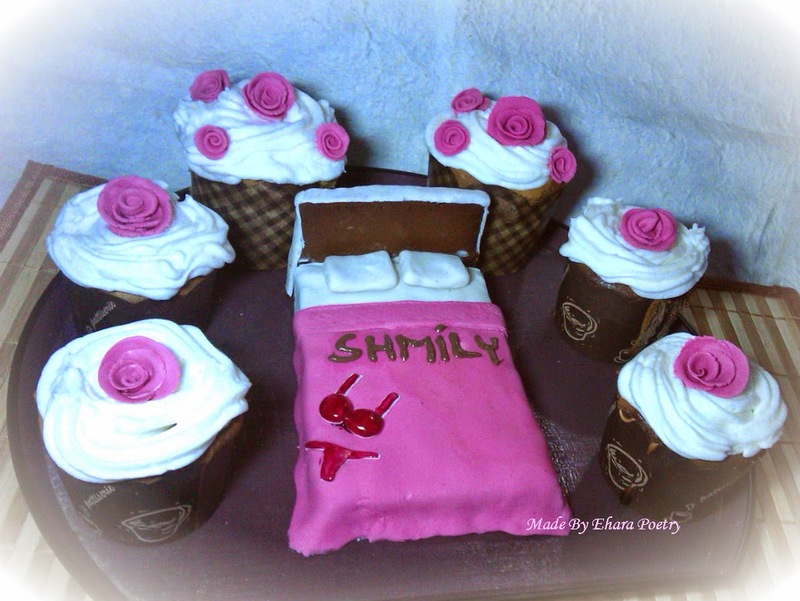 Well maybe because the price is different too, this one is a little bit expensive but really worth the price! I try my new lip crayon from IASO Lip Crayon Vivid, the shade is V01 Flame Rose. I really in love with the color <3 It's so bright, sooooo me! ahahaha Will make review post about this lip crayon soon! 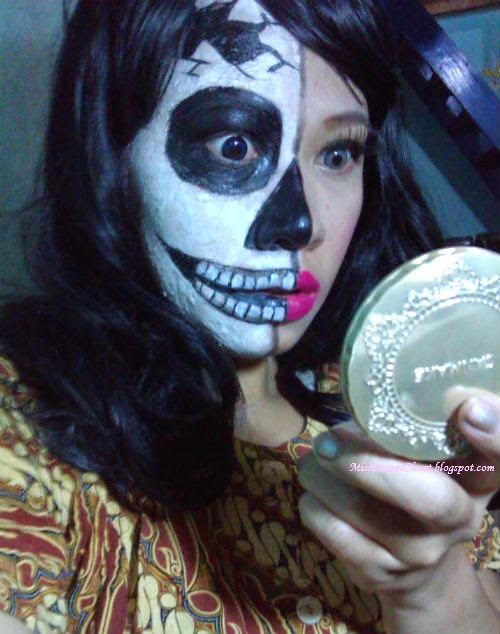 For the blush I wearing Canmake Cheek & Cheek #01. 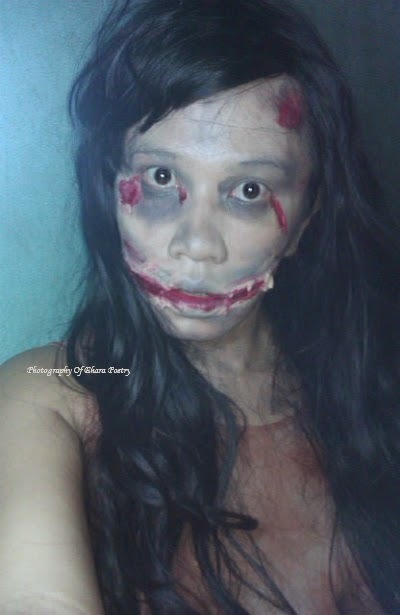 I try to looks like a killer but this weird face is the result, hahahaha.. 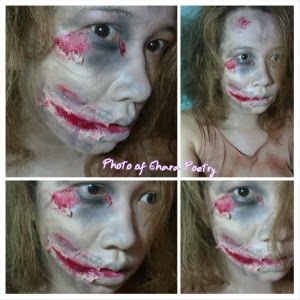 I will do Creepy Dolls for next Halloween Makeup, what you will be for the next halloween?